A Baton Rouge shoe store employee was booked on theft charges after refusing to cooperate with police, who wanted him to name the LSU player who gave him his own game-used gear to sell. 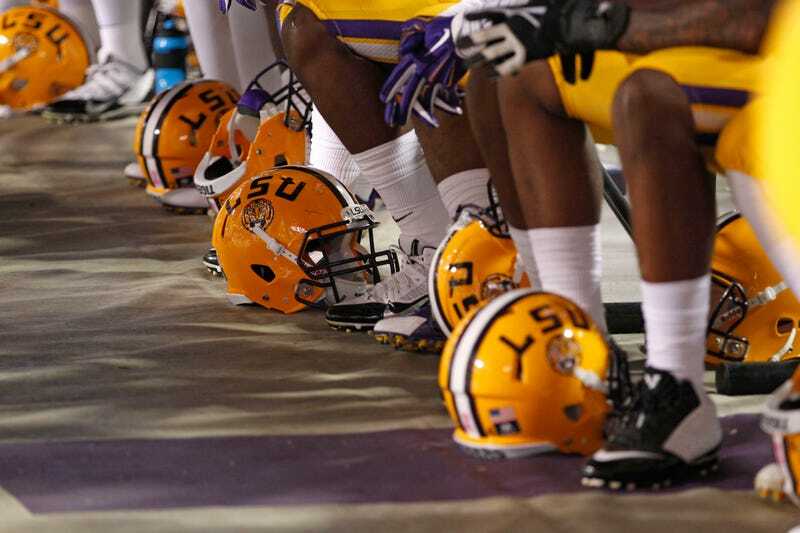 LSU's equipment manager called campus police after seeing game-worn cleats and gloves for sale on eBay. Both were worn during LSU's upset win over Ole Miss in October, and were going for about a hundred bucks each. Cops were able to track down the eBay seller as Fletcher Sanders, 25, and according to an affidavit, they offered him a deal if he would rat out the player. Sanders told police that he sold the gear for an LSU football player. But when an investigator asked Sanders to name the football player, Sanders clammed up, according to the report. The officer, in turn, told Sanders that he would be arrested if he did not cooperate, the report says. "Do what you have to do," Sanders responded, according to the report. "I am not going to be responsible for ruining someone's career." Sanders was booked into East Baton Rouge Parish Prison on counts of principal to theft and illegal possession of stolen things (he made bail on Tuesday). Because, as an LSU Police captain said, "the items are still LSU's property." And will be forever, for the athletic department to sell as it pleases! This wasn't Sanders's first eBay listing. According to WBRZ-TV, his seller history shows nearly $3,000 worth of game-worn LSU equipment. If Tigers players keep coming to him, it's for two reasons: he gives them a fair cut of the profit, and he doesn't sell them down the river.